I’m not usually a massive fan of amber. Don’t get me wrong, I do enjoy a good cosy dose of amber, but it’s just not my favourite style of perfume, perhaps because I haven’t found my amber yet. Or should I say ‘hadn’t found my amber yet’, that was until Ambre Céruléen came into my world. 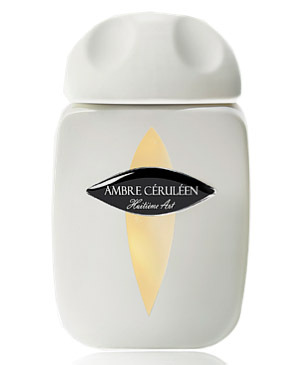 Ambre Céruléen is a euphorically beautiful amber that has everything a good amber should, and in perfect proportion. Velvety sandalwood, creamy vanilla and a light dusting of spices, namely cinnamon, clove and god-knows-what-else that makes it so utterly fabulous. A good amber should envelop you and wrap you in it’s warmth. The amber is the olfactory comfort blanket, it defends you from the cold, harsh realities of life and wraps you in a cloud of luxury, safety and love. Ambre Céruléen does all this in such a smooth and effortless way that I can’t help but fall in love with it. I wonder what the Amber Queen over at Olfactoria’s Travels thinks of this one? My first thought upon smelling Sucre D’Ebène was “Wow, this actually smells like burned sugar!” Sucre D’Ebène instantly makes me think for those glorious wisps of caramel, fastidiously constructed into a birds nest and wrapped around the finest of desserts. It is definitely an odd bird, that at times can be very difficult to wrap your head/nose around. Pierre Guillaume has a real talent for creating surprising gourmand confections that are rooted within deep woods and rich, exotic ingredients. Sucre D’Ebène is no exception, the dark brown sugar sits upon a bed of cosy, fluffy benzoin that makes it feel like a more adult version of candy floss, one that isn’t coloured in pink hues but tones of rather wonderful golden brown. Like a few fragrances within the Parfumerie Générale line, namely Musc Maori, I’m not entirely sure just how wearable Sucre D’Ebène is. Don’t get me wrong, it does smell wonderful on the skin, and I love to to smell it, I’m just still deliberating as to whether I would want to smell of it. That said, there is definitely something addictive about it that really appeals to my sweet tooth and whilst I’m still making my mind up I am more than happy to keep smelling this confection for grown-ups. Myrrhiad is the latest addition to the Huitième Art line and is so far the only perfume to be added to the line since its launch. I find it to be quite an unusual take on myrrh, a note that is usually paired with relatively dry, woody materials to amp up its masculine facets. With Myrrhiad, Guillaume takes a different approach and opts to use vanilla to soften and tame this most ancient of notes. The vanilla itself is very soft, it is quite understated and dry with a wonderfully sweet smoky aura that pairs pretty damn nicely with the myrrh. I especially like how the vanilla isn’t allowed to take over, something that it can so often do, it’s very easy to ‘over-egg the vanilla pudding’ as it were, but thankfully a good deal of vanilla restraint has been exercised here. To contrast the sweetness of the vanilla, black tea and liquorice have been added. Both of these ingredients add a myriad (no pun intended) of facets – earthy, rooty, herbal and menthol – that keep the vanilla in check and add a good deal of ‘darkness’ that is more than welcome. Myrrhiad is a very interesting perfume, but like Sucre D’Ebène, it has an unusual toasted-sugar note that I’m not entirely comfortable with in a perfume. That said it is inherently more wearable than the latter and It does smell great. If you’re looking for an unusual take on myrrh then I would highly recommend it. Ambre Céruléen, Sucre D’Ebène and Myrrhiad are available in 50ml Eau de Parfum for £88. This review is based on samples of Ambre Céruléen and Sucre D’Ebène supplied by Les Senteurs and a sample of Myrrhiad sourced myself. Posted in Amber, Gourmand, Huitième Art, Oriental, Parfumerie Générale, Perfume Reviews, Woody and tagged Amber, Ambre Céruléen, Gourmand, Huitième Art, Myrrhiad, Oriental, Parfumerie Générale, Pierre Guillaume, Sucre D'Ebène, Woody. Bookmark the permalink. In another instance of great minds thinking alike, perfume ESP, stars aligning etc., I’m currently testing the Huitième Art collection as well. Generally I love PG’s traditional perfumery creations a lot more than these pared down sketches on new, but undoubtedly interesting notes. Like you, I like to explore them, but would I want to wear them? So far, there is only one (maybe two) I would love to wear, the others seem more like fascinating experiments than perfumes to live in. “Perfume ESP” – I love it! I did wonder, as you saw in the post, what you thought of Ambre Céruléen, seeing as you are the amber queen and I shall look forward to your review. I’m totally with you on the experimental angle, it almost seems like a vanity project for Guillaume, and whilst the results are definitely interesting, AC is the only one that makes me want to consider a purchase. I have only tried the three though. I take it that you’re not a fan of the bottle then 😛 I love it, it’s just so unusual and feels great. But your La Femme Bleue was totally worth the poverty and starvation right?! I would recommend sampling the Hutiéme Art line if you get a chance, they’re definitely interesting! I tested most of these in a mad splurge last April and have no notes, just ticks and crosses beside each name! The amber one and the Sucre d’Ebene had crosses I am afraid: I think I also found the first strange and the second not especially wearable, as you say. However, I liked about five of them, and even the newer Myrrhiad that I tried the other week is growing on me as I appear to be developing a late flowering?/onset? tolerance for licorice. Myrrhiad seems to be getting a lot of good press from all corners of the blogosphere. Licorice (which my computer always changes to liquorice for some reason) is a funny note that I’ve also taken a while to love. It’s not something that I ever thought I’d want to smell of. You really make me want to try more from this line! 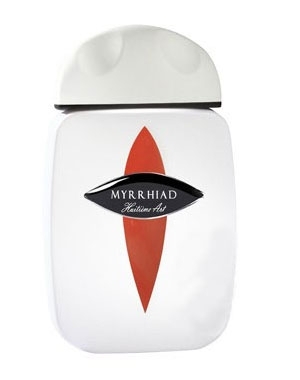 I’ve only tried Myrrhiad and liked the way it was so pared down you could detect every note. It really made me look forward to the new Guerlain myrrh perfume rather than want to buy a bottle though. Maybe I want more complexity for that money.. I love the burnt caramel of PG’s Aomassai so Sucre D’Ebène is a must try for me. I can see it might not be very wearable though. The Guerlain Myrrh is definitely intriguing, but I know what you mean re the money, £150 is a lot! I think you’d like Sucre d’Ebène, it’s VERY burnt! The bottles are trés cool aren’t they? I have yet to try any of the Huitieme Art series – I have been underwhelmed by the several PG scents I’ve tried so far. They’ve all been very nice, well-done, attractive things that somehow just failed to capture my imagination. Also, many of the ones I have tested reminded me of something else. That’s not to say that every scent MUST be arresting and individual and unique -there are bound to be variations on a theme – it’s just that the things that the PGs reminded me of were all preferable to me in some way. I completely understand where you are coming from there. There are a few surprises hidden in the line, and Huitiéme Art follows very much the same path. I’m so behind testing this line that I’m not even upset any more 🙂 I’ll get there eventually. Probably. But I liked everything I tried so far from Pierre Guillame. Maybe I’m that impressionable and he’s that good-looking but I think he’s extremely talented (and have I mentioned good-looking? 😉 ). Also, and sorry to point this out, but I believe you have a touch of misinformation in the above text. Hutième Art Parfums was not actually a collaboration with Octavian Coifan as such, (as far as the business or perfume creation). He merely honoured Octavian by naming his new line “8th Art” as he agreed with his concept that perfumery is the eighth artistic discipline. Other than that there was no actual “collaboration”. How strange, the information on the HA website is misleading in that respect. I shall amend the post, thanks for the heads up. I really need to try this line, I was in Les Senteurs the other day and completely forgot! Too busy wrapped up in other things. I’m only recently discovering this guys work and have been blown away by certain ones. For some reason, I keep imagining these fragrances to be too simplified and airy, something about the look of them, the descriptions, and the lack of notes creates a bad olfactory image in my head… not cool. I love Les Senteurs! Were you in their new Marble Arch store? The Huitiéme Art scents are quite paired back in comparison to the PG’s, but I wouldn’t say they were airy. Yeh been to the new place a few times now. The old ones just a bit far out ey. Well, I’ll give them a shot. Even “paired back” is concerning :’) I guess simplicity can be good… I’ll learn to accept that. Anotine Lie is doing a talk?! Oh man, I MUST go to that! Well they’re arranging it anyway, it’s due sometime in the next few months. I guess I’ll see you there then! It’s Etienne de Swardt who’s talking. I think all of these are great perfumes even if they aren’t for me. 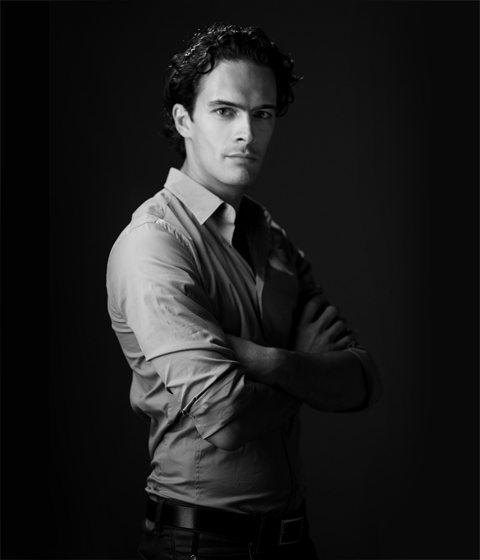 Guillaume is brilliant and I still want him to be in my perfumer pin-up calendar. We have to make a perfume pin-up calendar. I’ve even discovered a new, very attractive perfume-person – Carlos Huber from Arquiste, he’s buff ting and I want him as my birthday month (June) please.